The memorably vitriolic and immensely readable H.L.Mencken, once said, “Democracy is the art and science of running the circus from the monkey cage.” While anything that is attempted to be run by a democratically elected Government has both its adversaries and advocates, one thing which the common populace neither acknowledges nor accuses the State of, is the possession of an entrepreneurial bent. In a world where innovation is attributed to ingenuity originating from run down garages and the cubby holes of lone wolf geniuses, the credit for providing a traction for these endeavours is the sole preserve of Venture Capitalists and Angel Investors. The legion of examples cited by publications of repute and news channels of worth extolling the virtues of Venture Capitalists has almost transformed into proselytization. 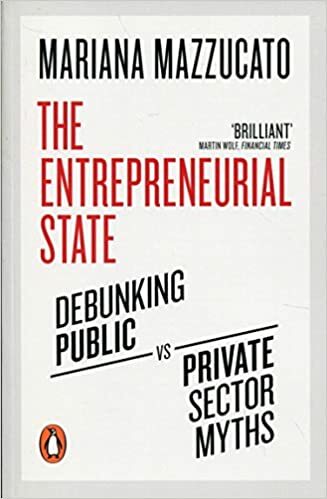 In her extremely provocative and insightful book, “The Entrepreneurial State: Debunking Public Vs Private Sector Myths” (“The Book”), Mariana Mazzucato (“the author”) makes a refreshing attempt to set the facts right and give the State its fair share of the credit in so far as pioneering innovation is concerned. Her theme for the book is laid down by a strong quote, courtesy Paul Berg, the 1980 Nobel Prize Winner in Chemistry. Berg asks, “Where were you guys [venture capitalists] in the ‘50s and ‘60s when all the funding had to be done in the basic science? Most of the discoveries that have fuelled [the industry] were created back then.” Primarily written in the context of the USA & UK ‘country contexts’, this book is nonetheless relevant across geographies and where States are equally involved in paving the paths for innovations. However, the strongest argument for the State’s role in innovation is the preserve of one of the lengthiest Chapters in the book. Imaginatively titled, “The State Behind The iPhone”, the author vigorously contends that “Apple was able to ride the wave of massive State investments in the ‘revolutionary’ technologies that underpinned the iPhone and iPad: internet, GPS, touch screen displays and communication technologies. Without these publicly funded technologies, there would have been no wave to foolishly surf.” The author also argues that in spite of contributing so much to the development of the iPhone and a whole horde of other products in the Apple stable that have now attained iconic success, the State has been rewarded or unrewarded, unfairly. While shareholders walk off with $453 billion worth of market capitalization. The sophisticated major components embedded within the Apple products are mainly procured from foreign manufacturers in South Korea, Taiwan and Japan, while the final assembly is contracted out to the company Foxconn in China. In 2011, Apple’s top 9 executives earned $441 Million, the equivalent of the annual earnings of 95,000 Foxconn assembly workers. Apple continues to institute complex corporate structures that primarily aid and assist in the evasion of taxes. This according to the author is a brazen dichotomy between socialization of risks and privatization of rewards. The Government, as per the author is also unfairly accused of not having the ability to ‘pick winners’. A classic case in point is the much touted and lamented about example of the bankruptcy of Solyndra. Under the American Recovery and Reinvestment Act of 2009, the brainchild of the Obama Administration, Solyndra received a $535 million U.S. Energy Department loan guarantee. Solyndra designed, manufactured, and sold solar photovoltaic (PV) systems composed of panels and mounting hardware for large, low-slope commercial rooftops. The panels perform optimally when mounted horizontally and packed closely together, the company claimed, covering significantly more of the typically available roof area and producing more electricity per rooftop on an annual basis than a conventional panel installation. Within two years of all the fanfare and flamboyance, Solyndra had filed for bankruptcy. The State was panned in various academic, business and political circles for not possessing the acuity to back the proper horse. While the successes of the State go unnoticed the failures become a scarring testimony to their inabilities. The author also underscores the primacy of the entrepreneurial state in incubating major new industries which are stepping stones to the urgently required transition to a low carbon, sustainable economy. She demonstrates how state investment in basic research becomes fundamental to the development of wind and solar power technologies for commercial applications Germany and China are well on their way towards making this endeavor a reality. Mariana Mazzucato does an exemplary work of “debunking Public Vs Private Sector Myths” (in her own words). This meticulously researched book will serve as a reliable and unbiased yardstick in evaluating the future contributions of both the Public and the Private sector in so far as path breaking innovations are concerned. At a time when government measures of any kind are vilified by ascribing to them the taint by ideologies and ‘direction-leanings’ while paradoxically the ventures of capitalistic entrepreneurship stay glorified, this book aims to demolish this ‘one directional’ sense of received wisdom. “The Entrepreneurial State” – Relevant and Responsible that makes for Recommended Reading.